Anxiety disorders affect more than 40 million Americans on average and occur twice as often in women than in men. Anxiety is a mental condition that is characterized by the exaggerated feelings of worry, tension, and nervousness, even when there are no immediate stressors. Postmenopause refers to the stage of a woman's life when menstruation has fully stopped. In the United States, the average age in which postmenopause occurs is 51; however, it varies depending on genetics and lifestyle. There are several different types of anxiety disorders, which include generalized anxiety disorder, panic disorder, social phobia, post-traumatic stress disorder, obsessive compulsive disorder, and separation anxiety. These disorders can be caused by many different things. Women are more susceptible to anxiety disorders because of the hormone fluctuations they experience after puberty - specifically during menstruation, pregnancy, and menopause. During postmenopause, a woman's estrogen levels are much lower than they were during her reproductive years. Estrogen significantly affects the brain's regulation of mood and emotions. Consequently, when a woman's estrogen levels drop, she is at higher risk of developing anxiety. It is important to know that menopausal symptoms begin to lessen once hormone levels subside during postmenopause. According to a study conducted by the National Health Service and its partners, one in four women in England aged 45 - 64 now experience some form of mental disorder - which is a 20% increase in the last 15 years. Unfortunately, many women tend to leave anxiety disorders untreated because they think that it is a normal part of aging. While this may be true to a certain degree, it is important to get properly diagnosed and treated so that symptoms do not worsen. Anxiety can affect a woman's ability to carry out daily tasks, making it difficult to concentrate and affecting personal relationships. Exercising regularly is the vital to reducing stress and releasing “feel-good” neurotransmitters, like serotonin, in the brain. The general recommendation is around 30 minutes of aerobic activity every day, or at least three times a week. Walking, cycling, and yoga are all excellent forms of low-impact workouts. Making simple dietary changes can also be beneficial to feeling your best. Including protein, fiber, fatty acids, and fruits and vegetables into daily meals is ideal for optimum performance and boosting energy. 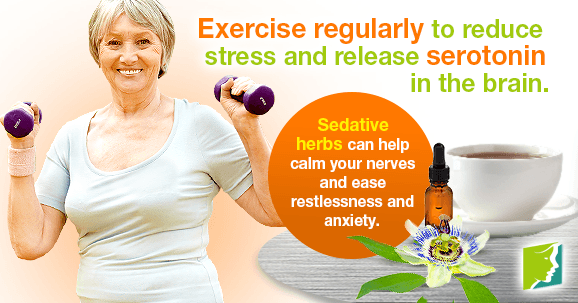 Taking sedative herbs, like valerian and passion flower, can help calm your nerves and ease restlessness and anxiety. Hormone fluctuations are the primary cause of anxiety in middle-aged women who are going through the menopause transition; however, stress and lifestyle can also induce anxiety. It is important to remember that once sharp hormone fluctuations subsides, menopausal symptoms will begin to lessen as well. Exercising regularly and taking time to relax are helpful ways to prevent anxiety attacks and symptoms.